The canoe sprint is a race where boats start at the same time, each boat in a separate lane, and compete to complete a course of a predetermined distance in the fastest time possible. In the canoe slalom event, competitors must display technique to navigate a decked canoe or kayak through a course of hanging gates on river rapids in the fastest time possible. In sprint events, competitors race on straight courses of 200m, 500m, etc. The speed with which competitors propel their canoes through the water is one of the most appealing aspects of the sprint events. 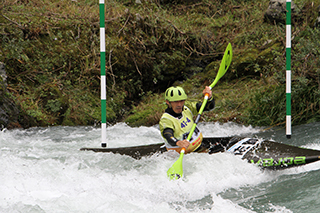 Slalom events require competitors to navigate a canoe or kayak along a winding course in strong currents. Spectators should look out for the competitors' skilful manipulation of the canoe/kayak. Both disciplines have Canadian canoe events and kayak events. In a kayak, a competitor sits facing the direction of travel, and propels the boat forwards by paddling on both sides of the craft with a paddle that has blades on both ends. In a Canadian canoe, a paddler kneels down on one knee, facing the direction of travel, and moves the boat forwards by paddling on either side, using a paddle with a single blade on one end. The canoe is one of the oldest tools and forms of transport known to man. The modern Canoe sport was formed in the mid-19th century in Britain - the first recognised canoe race taking place on the River Thames in Britain in 1866. In 1924, the International Canoe Federation was established in Copenhagen, Denmark as the international governing body for canoe-based sports. Canoeing was introduced as an official Olympic sport at the Berlin 1936 Olympic Games. At the London 1948 Games, women's events were added. At the Munich 1972 Games, men's and women's slalom events were newly added. Slalom events had been dropped after the 1976 Montreal Olympic Games, but returned in the 1992 Barcelona Olympic Games. The canoe is one of the oldest tools rooted in human lives, having been used as means of travel or tools for hunting and transport for thousands of years. The modern canoe sport was formed in the mid 19th century in Britain. The first canoe race took place on the Thames in Britain in 1866. In 1924, the International Canoe Federation was established in Copenhagen, Denmark as an international organization for canoe sport. Canoeing was introduced as an official Olympic sport at the Berlin 1936 Olympic Games. At the London 1948 Games, women's events were added. At the Munich 1972 Games, men's and women's slalom events were newly added. Slalom events had been dropped after the 1976 Montreal Olympic Games, but returned in the Barcelona 1992 Olympic Games.